Some time back, a few friends of mine and I got together and we went on one of our impromptu camping trips. So we were all having a fun time until someone pointed out that it was almost getting dark, and that we should probably start thinking of gathering wood for the campfire. Someone else had the bright idea that we should compete to see who would come back with the most wood in the shortest time. As it happens, I won. When they asked how I had done it, I took out my pocket chainsaw. And that’s what you need as well if you are into camping, hiking, hunting, or any other outdoorsy activity. Let me tell you a bit about pocket chainsaws and why you need one. I have also taken the liberty to prepare five wonderful reviews of five terrific pocket chainsaws you will love. As more and more people are getting into the outdoors lifestyle, more and more innovations and tools are being made to make the camping experience easier and more fun. A pocket chainsaw is basically what it sounds like. It’s a saw, a cutting tool, that is super portable so you can carry it around without breaking a sweat. Most of them are so light that you don’t even notice you are carrying one until you need to use them. And as you will see in my reviews of the pocket chainsaws, the manufacturers keep upping their game. So the teeth keep getting sharper and tougher. The idea is that you should cut your firewood as fast as possible. A typical pocket saw consists of a chain which looks like the one used on a chainsaw; there are handles attached on both ends of the chain. So you are pulling the handles on either side, acting as the fuel/engine, manually sawing through the wood. So you can understand that the sharper the teeth of your saw are, the faster you are going to cut the wood. It’s also important to have a long chain. If the chain is short, you will have to expend more energy, pulling back and forth, and you will tire quicker. But with a longer chain, more teeth are eating away at the wood, so you get done in record time. And that is how I surprised my friends. I had a superior pocket chainsaw! Are you going camping or hunting? This is the ideal pocket chainsaw for you. It will easily replace your pruning or pole saw. And even as a homeowner, this Sportsman pocket chainsaw will give you superb service. The Sportsman brand is well known for its focus on providing an excellent customer experience and the overall innovativeness of its designs. The saw is perfect for Boy Scouts. It will fit comfortably in your bug out bag with the rest of your emergency gear. The teeth are bi-directional; and as such, can cut wood both ways. Made of high strength, heat-treated steel, the durability of the chainsaw is unquestionable. Plus, these cutting teeth are self-cleaning. And at 4.8 ounces, it’s super light, so it won’t tire you to carry it around. Also, it’s versatile, flexible, and compact. It has a longer chain than you see in most pocket chainsaws (36 inches). This makes it extra fast at cutting through wood. That’s because longer chains mean longer strokes and more teeth running through the piece of wood. Naturally, cutting time reduces. With a longer chain, you also improve your posture, so less fatigue. And you can cut the thick limbs a shorter cannot. Here is a chainsaw designed for survival in the woods. It’s a great tool to help you cut twigs and limbs from trees when you are out camping. And if you get sent to gather firewood, you will surprise your camping companions with how fast you do your assigned task. The teeth are made of carbon steel, so you can be sure that cutting is fast and easy. 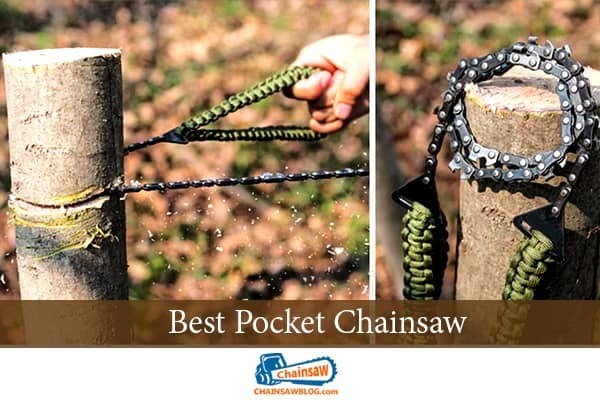 That is exactly what you want in a pocket chainsaw; especially in the outdoors, when sometimes time is of the essence, like when it’s almost getting dark, and you need wood for the campfire quick. Another thing that should give you a warm feeling is learning that this Chainmate pocket chainsaw is made in the USA. The factory is in New England, and the machines used are all American. People who need it include campers, mountain bikers, hikers, snowmobilers, and all sorts of outdoorsy individuals.It should give you a thrill to learn that this saw was once only available to the military and professionals, but you can now own one as well ! Comes with pouch and belt clip. Large heavy-duty strap handles a good fit for winter gloves. This LivWild camping chainsaw is what you have been looking for. First, it’s lightweight and compact. So it won’t be a pain taking it with you on your camping trip. Second, it will easily cut logs of firewood in a matter of seconds. It is a must-have for camping, hiking, emergencies, and even basic yard work back at home. And if you are looking for something durable, you have found it. You see, the teeth are strong. I am talking about industrial grade, heat-treated carbon steel teeth. There is a blade on every link; which is three times more blades than most pocket chainsaws have. So it’s more effective. The links are flexible, which gives you the steady, flexible bi-directional motion that enables you to quickly and easily cut through the branches of trees for firewood. Flexible, bi-directional, self-cleaning cutting teeth. Industrial grade, heat-treated carbon steel teeth. It has bi-directional cutting teeth which make cutting time more fun since it goes so quickly and without many hitches. And like other SOS Gear camping tools and equipment, this chainsaw ﻿is made from high-strength, heat-treated carbon alloy and steel. So you are assured of durability, which is what you need in an outdoors tool. Also, it has extra strong nylon straps. The pocket chainsaw is an attractive choice too thanks to its camouflage color. All your camping friends will admire it and want one for themselves. And it’s easy to carry since it’s not heavy. You will barely know it’s there until you need it. Made from heat-treated, high strength carbon alloy and steel for durability. Has super strong nylon straps. Lightweight and compact for easy portability. Can get either 24-inch or 36-inch chain. With a cutting blade on every single link, this Canadian Shield Camping chainsaw has three times more teeth than the average pocket chainsaw. Naturally, this translates to you making easy work of twigs, tree limbs, and logs when you are gathering firewood for your campfire. It comes with bi-directional, self-cleaning cutting teeth. They are made of industrial-grade, heat-treated steel. They tear through wood with a ferocious ease that is wonderful to see. Wonderful because of the sheer power, and also because you can get done cutting wood twice as fast as you usually take to cut wood. And if you don’t want something that will feel like a rock, I hear you. Why not give this light-weight, fun-to-carry Canadian Shield Camping chainsaw a chance. It will fit quite nicely in your bug-out bag when you go on your next awesome outdoorsy adventure. Strong, nylon handles, orange in color for better visibility. Cutting blade on every link; that is three times more teeth than other saws. The folding saw is another portable saw that is popular with hikers, campers, and other outdoorsy types. It has one blade with serrated teeth on it. It’s like a penknife, only with cutting teeth rather than a sharp blade. It’s called a folding saw because the blade folds itself back into the handle. Folding saws and pocket chainsaws are both effective at what they do. One of the main differences is that with a folding saw, only one hand is used when cutting. But with pocket chainsaws, you use both. It’s also easier to focus on one particular point when you are using a folding saw. With the pocket chainsaw, the chain may slip from the place you are attempting ﻿to cut with your gloves . Also, it’s necessary to wear gloves when you are using a pocket chainsaw because of the risk of running one side across the thumb on your other hand. So it’s safer to use a folding saw. But on the plus side, pocket chainsaws do tend to be faster than folding saws. So if you want to impress your friends as I did with how fast you can cut wood next time you go hiking, do yourself a big favor and buy a pocket chainsaw. Check out the excellent ﻿saws I have reviewed in this article, and choose the one you like best.